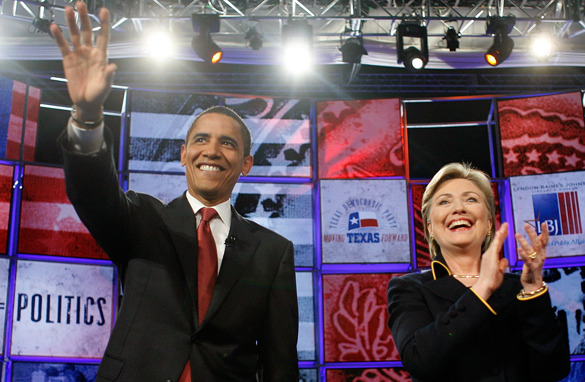 Jimmy Carter is not a fan of the idea of an Obama-Clinton ticket. (CNN) - A host of prominent Democrats are pushing for an Obama-Clinton unity ticket - but Jimmy Carter isn't one of them. The former president, who publicly endorsed Barack Obama shortly before polls closed Tuesday in the final two primary states, told a London newspaper that a joint ticket between the two former rivals would be "the worst mistake that could be made." "That would just accumulate the negative aspects of both candidates," Carter told the Guardian, saying that both candidates' vulnerabilities could overshadow that the ticket if the two team up together. "If you take that 50 percent who just don't want to vote for Clinton and add it to whatever element there might be who don't think Obama is white enough or old enough or experienced enough or because he's got a middle name that sounds Arab, you could have the worst of both worlds," he said. This is not the first time the former president has expressed doubt in the success of a unity ticket. Speaking at a Houston event late last month, Carter called the prospect "highly unlikely," and said other potential picks could better serve the Illinois senator. "I think it would be highly unlikely for Obama to ask her to take it," he said then. "Because I don't see how it would help his ticket. I think he needs somebody like a [former Georgia Sen.] Sam Nunn, but I won't name others. But I think if he asked her, she would take it." Carter largely stayed on the sidelines during his party's prolonged presidential nomination fight, though the Georgia Democrat had long hinted his preference for Obama. Speaking with Sky News last month before he made his endorsement, Carter said that once the final two contests had been held June 3, it would be time for Clinton to give up her presidential bid. Hillary as a VP? NO WAY...! it will never work, it will be a nightmare!